Wash the grapes and put 1 each on the end of a popsicle stick. Freeze for 1 hour or until frozen. In a container, mix the chia and granola. Pour the Greek yogurt in another container. Once the grapes are frozen, dip them first in the yogurt, and later in the chia seed and granola mix. Arrange the grapes on a plate and freeze for an additional 30 minutes. 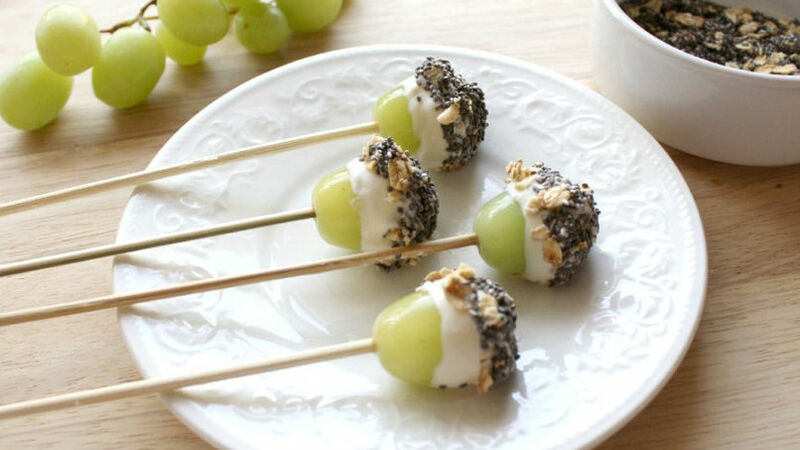 Pair the grapes with your favorite flavor Greek yogurt. Grapes are one of my family’s favorite foods. At home, we serve them for breakfast, in salads, beverages and in desserts. With this summer heat, it occurred to me one day to freeze and then dip them in yogurt for a delicious and refreshing appetizer; a delightful treat for kids and adults alike. Be inspired and make these delicious grape poppers with granola and chia seeds. They’re delicious and perfect to beat the heat this summer.